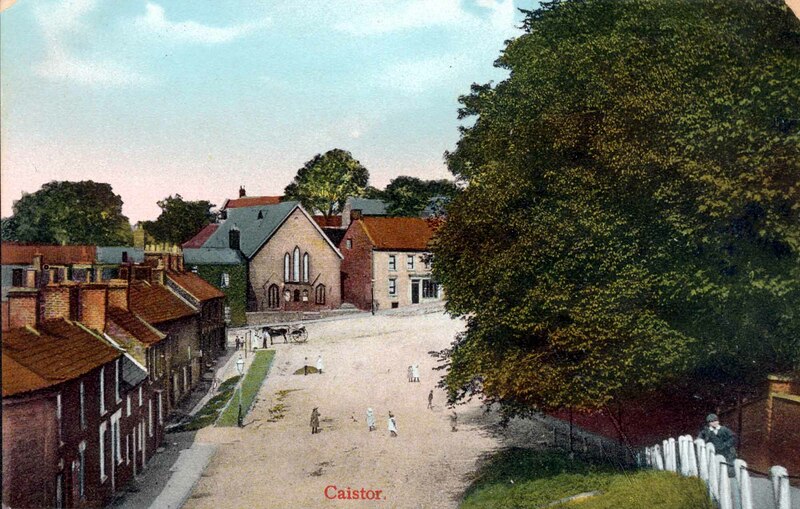 CAISTOR – Some mischievous vagabonds supposed to have been attracted to a house of ill fame in the vicinity of the Primitive Methodist Chapel, stripped a quantity of thatch from the roof of an old house on the night of Saturday week and carried it into the Primitive Methodist Chapel and strewed it about the pews. The mischief was not discovered before Sunday morning, and the morning service was consequently omitted. James Savage – Oh, the launderette! Sarah Morton Robinson – Use to skive school and hang out in the laundry!! I loved the sweet van that use to come to the village!!! …. Mat Cleve – We put a lot of money into those machines on the wall. Stephen Kerrawn – It was Mr and Mrs Edis that had the launderette installed, so it must be during or after their time. Paul Edis- Mum had it when this picture was taken. Dad had a consignment of wood which was used above the door. The wash tub came when i was still at school. Happy memories of growing up I remember and still have some of the posters etc. 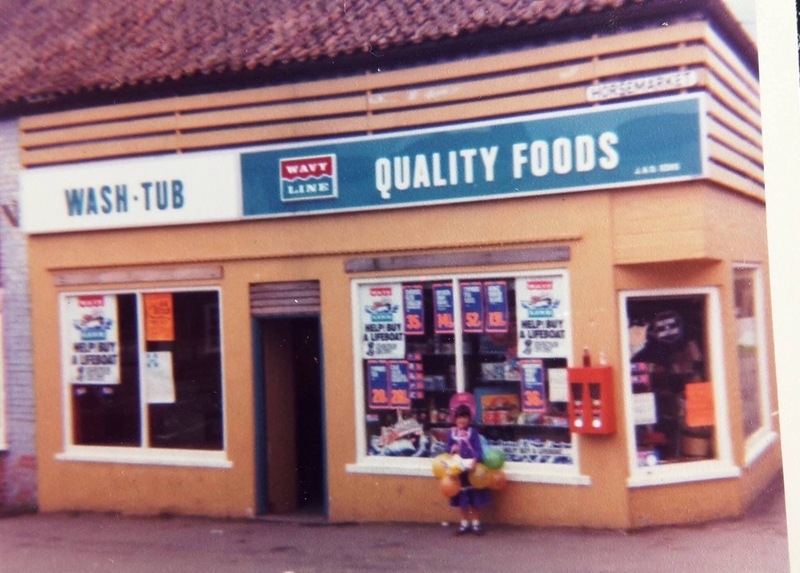 Sarah Ralph – I remember spending a great deal of my pocket money in there! 10p a week! Ann Hills – Before Mrs. Edis had it , I think it was owned by a Mrs Walton. 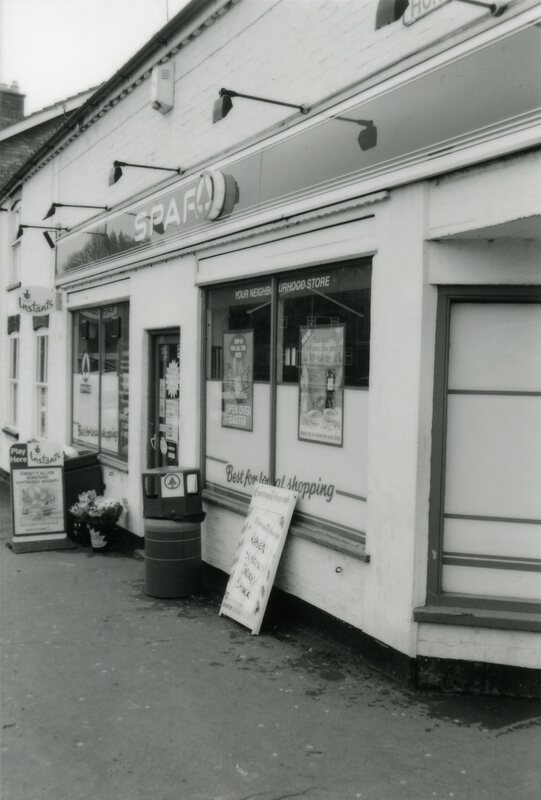 Ivan Baker – George and Marjory Walton had the shop previously. Adrian Degnan – I also vaguely remember some vending machines outside Bontofts and outside the old Co-op where the pizza place is now. Not sure what was in them.. chewing gum, I think, but could just as easily have been No6. Julie Walker-Jones – I remember those outside Bontoft’s had ciggies in one and Cadburys Fruit n Nut/wholenut in the other. Johnny Patterson – I remember them. There was fruit and nut, and whole nut. I remember Killer kicking them off the wall one night after a town hall disco. I think I gained about £1.30 in ten pences!! Mrs. Edis was on town council at one time As well as the shop it was a laundrette. Jan Clayton – I remember Mrs Edis, I use to live in the cottage next to the youth club, what is now the heritage centre in 1974/5. She had a loaf of bread & pint of milk on order for me every day. Lesley Cody – I worked at Edis’s shop as a Saturday girl whilst I was still at school. I worked with Mrs.Gray who was a wonderful elderly lady and I enjoyed working with her, she had a brilliant sense of humour.Mrs. Edis ran the shop, and could be quite tempermental, she was often helped by her sons Peter and Barry who were very friendly. This would have been about 1968 and I was there for about a couple of years. Just remembered I used to visit during piano lessons round the corner opposite the stream. Lorraine Whitehead – She moved to Thoresway after she retired. She lived in one of the cottages opposite Greens Barn in the centre of the village. Charlie Winn – I worked there for 10 years. I was born at Thoresway Grange. The earliest mention of any property on the site that we have is in 1760 when an Edward Moody mortgaged it. Since Caistor Church Registers show Edward getting married in 1761 we may conclude there was a malt kiln. This malt kiln came into the possession of John Walesby Carr. In 1835 he sold it to Robert Eyre, a cheesemonger, for £250. He did not want it and pulled it down and replaced it by seven cottages. So most of the present shop and houses etc date from this time. In 1821 Hiley sold to Thomas J. Dixon and Marmaduke Dixon, who used the buildinga at least in part for their malting business. 1826 December 16th – Caistor, Lincolnshire – To Maltsters, a desirable situation for trade. To be sold by private contract, or to be let, from year to year, or for a term of years with immediate possessions. All that old-established and well-accustomed Malt Kiln, now in excellent repair, and upon which a very considerable sum of money has been expended in fitting up the Drying-kiln and other parts of the premises upon the newest and best construction, together with suitable attached and detached out-houses and offices, and all other necessary conveniences thereto adjoining and belonging, and which is now in full trade. 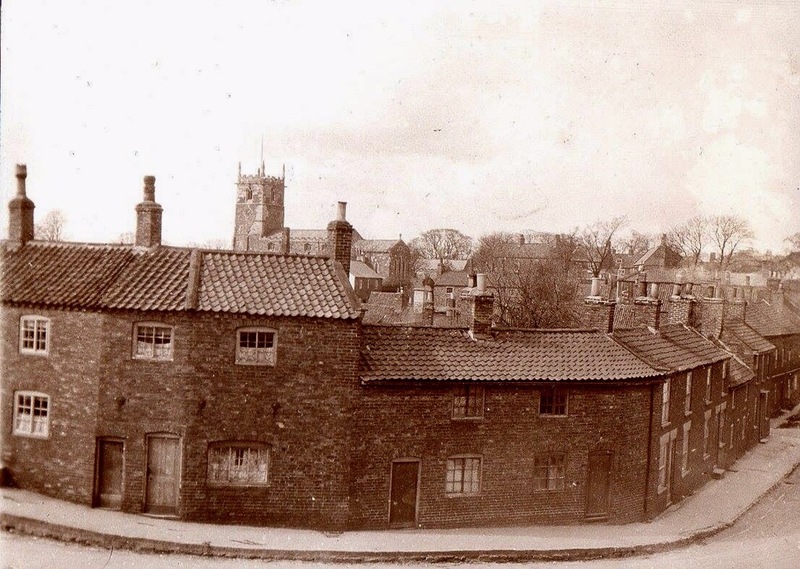 The above premises are situated in the Horse Market in Caistor aforesaid, are in very good repair, and the situation is remarkably well calculated for carrying on an extensive and profitable general business. William Malam, upon the premises, will show the same; and further particulars may be known on applying (either by letters post paid, or personally) at the office of Mr. Dixon, solicitor, Caistor. When it was sold again in 1834 to James G. Dixon, the four tenements were described as having chambers above them used as warehouses. When in 1866 William Shirley bought the property, it had gone down in value; he got for £100 only what was described as “two cottages with chambers overhead, formerly used as warehouses”. 100; so for the first time recorded one owner had the whole of the present property. Sue Hare – My great grandad Harry (first man on the left. John Robert is the middle man at the top. Both Harry and John are brothers to Nellie. This is Nellie Dixon’s marriage to Arthur Frame. June 1901. Walter is on the far right. 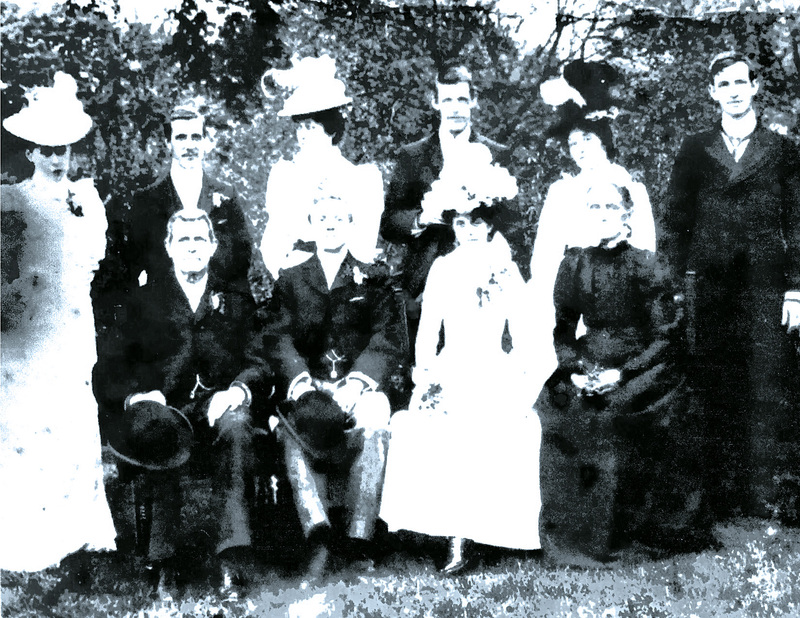 The elderly couple are my great, great grandad, Charles, and Emma (Saunby) my great, great grandma. The following three films feature Ken Clark and Arthur Clarke. They were recorded and edited by Alan Dennis. 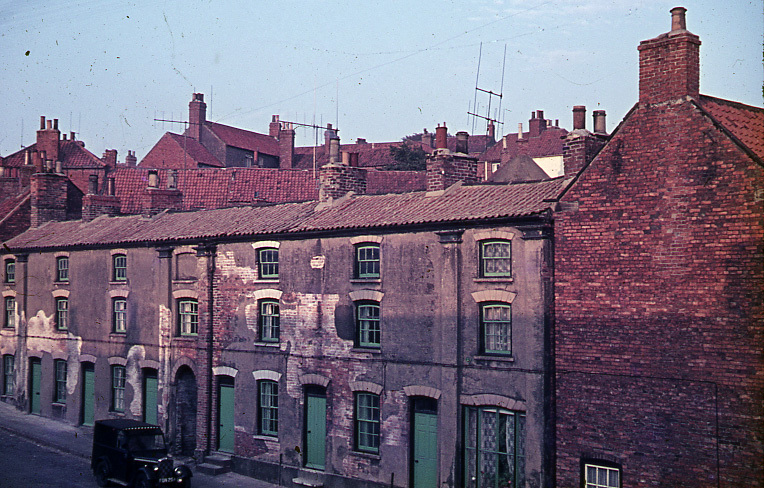 The cottages in the centre of this photograph were demolished early in the C20th after a murder took place in one of them. 1919 November 10th The Caistor Tragedy. Prisoner At The Police Court. At Caistor this morning William Wright, an ex-soldier, was committed for trial, charged with the wilful murder of Annie Coulbeck. The court was crowded when the prisoner, a short thick-set: unshaven man was brought in. He appeared quite indifferent and strolled into court with his hands in his pockets. After a casual glance round the packed room, he seated himself in the dock, and apparently took no further interest in the proceedings. Mr Pashley, who prosecuted, exclaimed that prisoner and the dead woman were sweethearts. On the morning of October 29th, the unfortunate woman was found strangled at her cottage in the horse market. It was known that the night before the prisoner had been at the house, and the police interviewed the prisoner. After the discovery of the body, he made what amounted to a confession. He signed a statement in which he said, “We had few words about a brooch. I strangled her with my hands, put out the light, and went home.” Witnesses were called to recount the evidence already given at the inquest. Prisoner did not ask any questions until Arthur Johnson, a timber seller, went into the box and declared that he saw the prisoner leaving the dead woman’s house, at a quarter to seven on the morning of October 29th. “It was not the Wednesday morning,” said the prisoner, “it was Tuesday.” Witness maintained that it was Wednesday , and prisoner resuming his seat, said, “I will prove that it was Tuesday.”. A SMILE OF SCORN. When Jim Campey, a chimney sweep, went into the witness box, prisoner smiled at him scornfully. He was the witness whom Wright attacked at the inquest. Campey said that a few days before the murder, prisoner said to him, ” Sweep, black cat, three weeks, rope, hanged by the neck, finish.” When prisoner was committed for trial, Mr Pashley suggested that as he had been undefended so far he ought to have legal assistance at the trial, and the Bench intimated that it would be provided.